We were delighted to welcome cast members from Old Souls, along to perform some of the scenes from their comedy play. Thank you to Vicki for thinking of us. Staff and clients had a lovely morning. 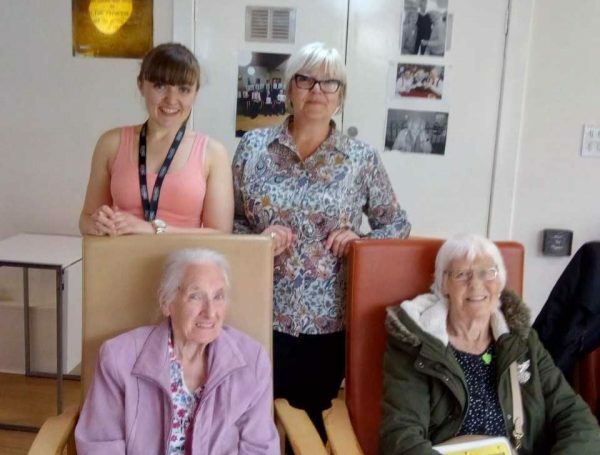 This show brought to life the essence of Vintage Vibes and LifeCare Edinburgh – matching someone older and lonely with a volunteer. It’s a soft and lovely comedy about a blossoming friendship between Rosie and Vera, which challenges your expectations of what an “old woman” and a “young girl” should be. Bound together by laughter and Irish coffee we loved seeing their relationship grow and them become an essential part of each other’s lives. Heartwarming…entertaining and upbeat, Old Souls is at its heart an exploration of the universality of friendship and the need to grasp onto experience to lead a fulfilled life. The friendship between Rosie and Vera is heartwarming, with the usual exchange of life lessons; imposter syndrome and the fear that accompanies any life development are dealt with eloquently and cheerfully, and the consideration of the possible loneliness of old age is moving but sympathetic. Thank you to the writers, cast and crew for supporting LifeCare this festival. Thaw told the story of Laura. At the peak of her life and at its end. As her mind unravels she is transported back to her most vivid memory. All proceeds help to support those who use our services.